We’ve already had our first taste of winter. Wow. Bit of a shock. Particularly for our six local hedgehogs. They’ve been coming every evening all autumn to tuck into the dried cat food we put out and paddle in the water bowl we have in our front garden. Not any more. No more snuffling and chomping. Just silence after dark. No tiny footprints in the snow. The mummy and her three babies, now a healthy 600-700 grams or so, and the two middle-sized hoggies have all retired to bed. Tuckered out from scoffing so much and now tucked up tight hibernating. Knowing Danish winters can be hard, I spent an afternoon remodelling an old chest from the shed into a luxury semi-detached home for hoggies. I dragged it into position on top of a pallet or two, sawed out an entry hole at each end, fitted a partition in the middle, filled it with hay and hoped for the best. Sawing the holes was easy as the bottom had already fallen out. It is right under our kitchen window so I was pretty sure it would be a bit too exposed, but it was worth a try. Dr Watson, our dog, showed no interest in it at all, if that was any indication. One night, a week or so later, Jake and I were enjoying our nightly ‘hog watch’, snuggled up on garden chairs in the dark wrapped in thick blankets, when we heard a very funny noise. It sounded like the neighbour was sawing wood. But not in the dark, surely. What could it be? On closer inspection, creeping about listening, we traced the noise back to its source and found it was coming from inside the new hoggie home! Two potential new occupants were apparently discussing the distinct lack of indoor conveniences. Luckily for hedgehogs, they sleep all winter, so having no loo isn’t a problem and neither is sharing. For human families, spending all winter together indoors can be a bit daunting. After all, expectations of a spectacular Christmas and all that it involves can sometimes loom larger than life. Even generally nice people get their stockings in a twist about Christmas traditions, especially Danes, who take it all very seriously. Well, technically, Father Christmas does live in a part of the Danish kingdom, so that’s understandable. If several cultures are added to the family mix of what to eat when and with which friends or relations, it can all be overwhelming, with planning invitations being issued in October. I reckon that’s why so many Danes go skiing. It’s something they can’t do in Denmark because it’s pretty flat, so they simply have to go abroad, leaving the hassle behind. But that’s expensive. So if you’re feeling cooped up with the kids, and the question of eating turkey or duck on Christmas Day or Christmas Eve is ruffling feathers back home, don’t quail! 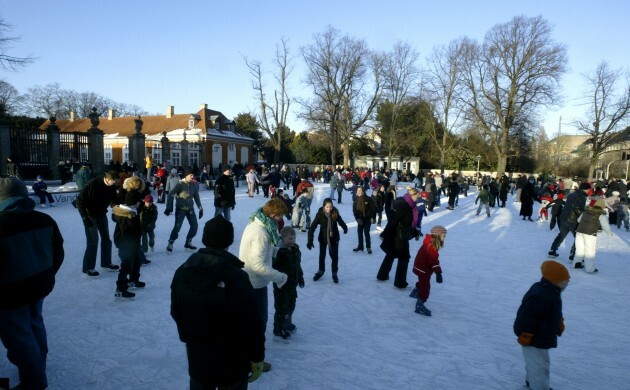 Spend some quality time together carving figures of eight outside instead at the Frederiksberg Runddel skating rink (see factbox). It’s open for three months (closes February 28), which is plenty of time to feel like a kid again. The wind in your hair – unless you’re clever enough to remember a good thick woolly hat to protect your ears. The tingle in your fingers and toes – unless you wear nice thick gloves and socks. And the wonder of waking up to monitor the full colour spectrum of a bruise or two over the course of a week – unless you wear padded trousers. Actually, it’s healthy for adults to fall over once in a while. It produces a good helping of empathy the next time a child comes a cropper. Jakob has been first with words of comfort and a cold compress since measuring his length on Jake’s new Segboard, for example. Nevertheless, there’s help for nervous skaters as you can also hire a penguin for 50 kroner for half an hour! But don’t get too excited – it’s not a live penguin but a plastic one to help children stay upright. And to keep them energised, there’s a cafe nearby, although you can take your own hot soup or cocoa with you. Have a great Christmas and New Year! Cheers to 2016! Helen Dyrbye is a published author, translator and former scout leader from East Anglia in England who relocated to Denmark a long time ago and loves it here as much as ‘back home’. Early December events: come into play!